You’re an athlete. Place yourself in the field or court of your mind. The sun is beating down relentlessly, and tensions are peaking. The competition is waning, but they’re not too far behind, if not right on your back. You need to focus on the moment, the goal and the finish line. You can’t let anything get in your way. Just as your fellow teammates are vital to your success, so are your tools. You wouldn’t show up to football practice without your helmet and pads, right? You also wouldn’t show up to a game wearing a sports jacket and tie. Having the right equipment is essential to achieving top-level performance and scoring that winning point. As everyone knows, this applies both on and off the field - in the game we call life. 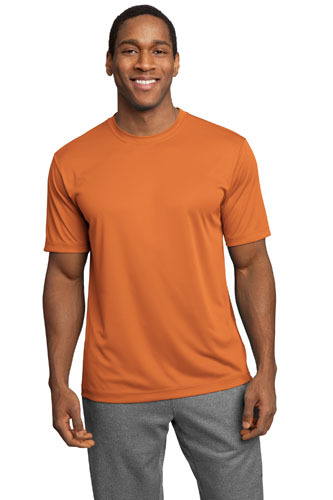 The new Sport-Tex Competitor Tee will easily become an essential in your active-wear wardrobe. The moisture-wicking, breathable material will lend a comfortable, non-sticky experience, allowing you to focus on what’s important: the end goal. Whether your goal is to find the right uniform for your school’s soccer team or for your companies team-building activity, the Sport-Tek’s new PosiCharge Technology locks in color and will ensure your customized logo never fades and remains a vibrant representation of you and your teammates. The Sport-Tex Tee can be ordered in a variety of colors to match your school’s mascot or business logo. Hues come in: Black, White, Silver, Cardinal, Carolina Blue, Deep Orange, Forest Green, Gold, Iron Grey, Kelly Green, Light Pink, Lime Shock, Maroon, Neon Orange, Neon Pink, Neon Yellow, Purple, Sand, Texas Orange, Tropic Blue, True Navy, True Red, True Royal and Vegas Gold. The lightweight, loose material is bound to make this style popular among your students or employees. After all, you need inspiration for a great game or company outing, so you need the right motivation! Your team will be excited to don their new armor and accomplish any goal they set. The Sport-Tex Tee weighs approximately 3.8 ounces and is made from 100% cationic polyester interlock, making this design hardwearing. The removable tag and set in sleeves also make for comfortable wearing. Adult sizes range from Extra Small to 4 Extra Large, accommodating any size and body type. Combining the game-changing PosiCharge Technology, with the style and comfort designed for champions, the Sport-Tex Competitor Tee is bound to make winners out of you and your fellow warriors.